The images on the screen may be different from the actual conditions. The displayable range varies depending on the vehicle and road conditions. The displayable range is limited. Objects under the bumper or around the bumper ends cannot be displayed. The distance appearing in the displayed image is different from the actual distance because the rear view parking camera is equipped with a specific lens. 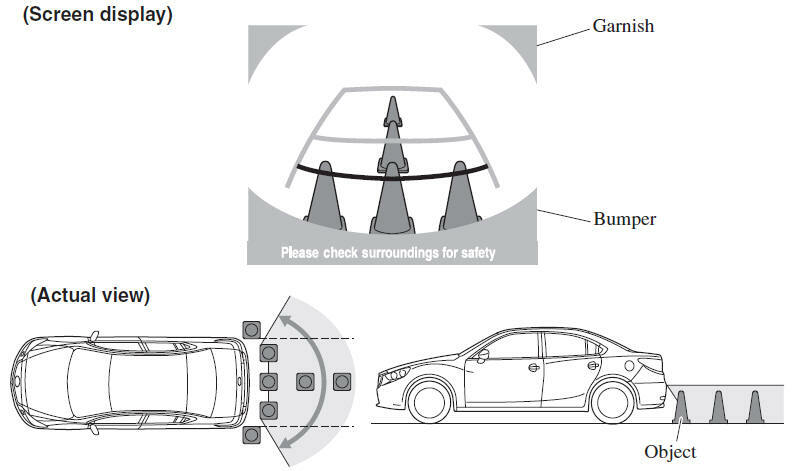 Some optionally installed vehicle accessories may be picked up by the camera. Do not install any optional parts that can interfere with the camera view, such as illuminating parts or parts made of reflective material. It may be difficult to see the display under the following conditions, however, it does not indicate a malfunction. When the temperature around the lens is high/low. When the camera is wet such as on a rainy day or during periods of high humidity. When foreign material such as mud is stuck around the camera. When the camera lens reflects sunlight or headlight beams. Image display may be delayed if the temperature around the camera is low.